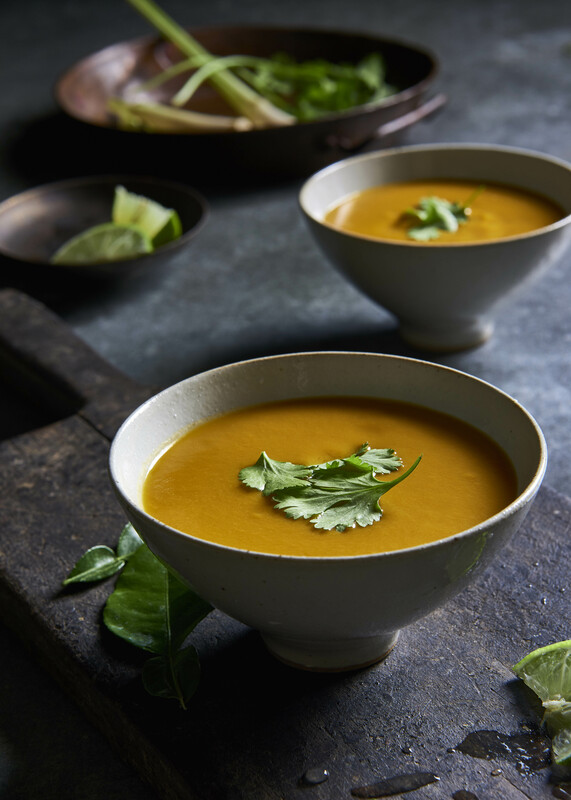 A dish that’s big on taste, The Blender Girl, Tess Masters is back with a Thai Pumpkin Soup that’s warm, spicy and perfect for cold winter days. In a large saucepan over medium heat, warm the coconut oil, and sauté the onion and garlic for about 5 minutes, until the onions are soft and translucent. Bring the heat down to low, and add the tomato paste, lemongrass, ginger, kaffir lime leaves, and red pepper flakes, and sauté for another minute until well combined and fragrant. Add the broth, seasoning powder, squash, cilantro roots, and tamari, increase the heat to high, and bring just to a boil. Reduce the heat to medium, and simmer for about 30 minutes, until the squash is fork tender. Remove the saucepan from the heat, and allow the soup to cool slightly; stir in the coconut milk and lime juice. Pour the soup into your blender in batches, and blast on high for 30 to 60 seconds, until smooth and creamy. Return the soup to the saucepan, and warm it over low heat. Season to taste. To serve, ladle the soup into bowls and garnish with cilantro leaves, and pass lime juice at the table.